Menulog delivers for BIG BUNZ so you'll be able to track your courier on a map. Mixed lettuce, tomato, cucumber, onion, olives, feta cheese and village dressing. Four char-grilled skewers marinated in Mediterranean herbs and spices. Served with crunchy seasoned potato fries, pitta bread, villager sauce (garlic) and village salad. 100% real beef. Our Aussie grass-fed beef patties are homemade, using the finest cuts and highest quality ingredients. Combo = Regular fries and can of drink. Beef patty, cheese, onion, pickles, ketchup and mustard sauce. Beef patty, tomato, onion, lettuce and villager sauce (garlic). Beef patty, grilled onion, lettuce, tomato, beetroot, sweet and smokey BBQ sauce. Beef patty, cheese, lettuce, tomato, onion, pickles and feast sauce. Beef patty, cheese, pineapple, lettuce, onion and big bunz sauce. Beef patty, bacon, cheese, tomato, onion, pickles and jalapeno mayonnaise with a drizzle of "Da bomb" sauce. Beef patty, cheese, bacon, egg, Hollandaise, sweet and smokey BBQ sauce. 200 day aged premium Aussie grass-fed scotch fillet steak, cheese, lettuce, tomato, onion, beetroot and big bunz sauce. 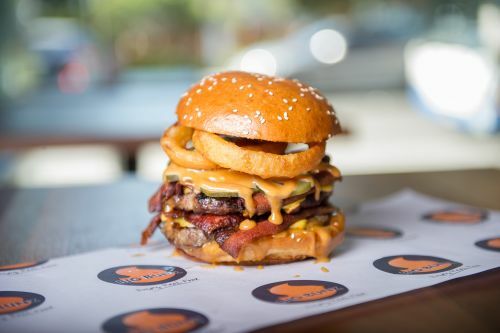 Double beef patty, double cheese, double bacon, onion rings, pickles and big bunz sauce. Grilled chicken breast fillet, cheese, lettuce and mayonnaise. Lightly crumbed chicken breast fillet, cheese, lettuce, da bomb chilli sauce and mayonnaise. Grilled chicken breast fillet, cheese, lettuce, jalapenos and spicy jalapeno mayonnaise. Chicken schnitzel, cheese, lettuce and mayonnaise. Southern fried chicken, cheese, bacon, lettuce, tomato and ranch sauce. Grilled chicken breast fillet, cheese, bacon, pineapple, lettuce and aoli. Lightly crumbed chicken breast fillet, cheese, pineapple, lettuce, avocado and sweet chilli mayonnaise sauce. Homemade vegetable patty, cheese, onion, lettuce, tomato, beetroot, sour cream and sweet chilli sauce. Crumbed fish fillet, cheese, lettuce and fish bunz sauce. Southern fried coated chicken wingz. Southern fried coated chicken breast tenderloinz. Brioche roll, beef hot dog, grilled onion and pickles with your choice of tomato, BBQ, Da bomb or mustard sauce. Tastes great with grilled mozzarella cheese. Includes fries and juice poppa (tropical). Grilled beef, cheeze and tomato sauce. Grilled chicken breast, cheeze and mayonnaise. Seasoned crunchy fries, topped with mozzarella, parmesan, bacon and drizzled with house-sauce. Thickshake- chocolate, vanilla, strawberry or caramel. A mixture of Nutella and fluffy marshmallow blended through full cream milk and ice cream.